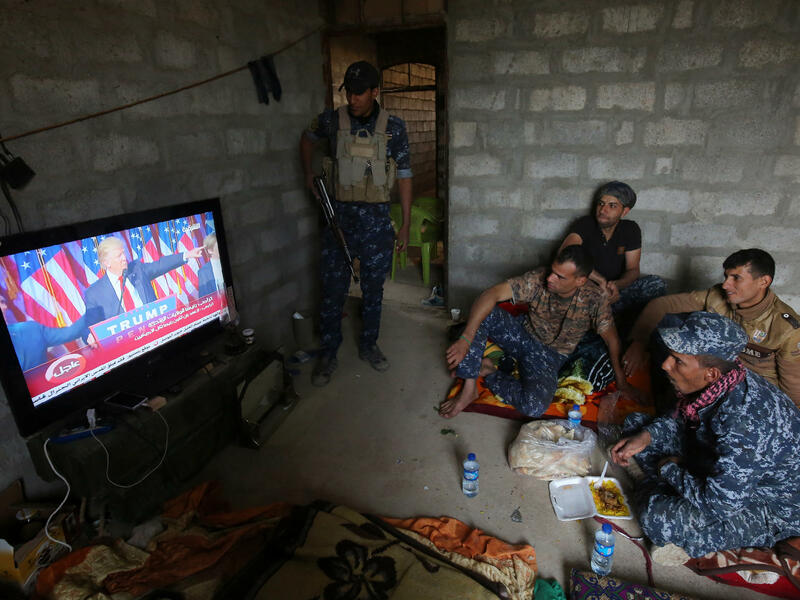 Members of the Iraqi forces watch Donald Trump giving a speech after his election win. They are part of the ongoing military operation to retake the Iraqi city of Mosul from ISIS, which Trump has vowed to destroy. 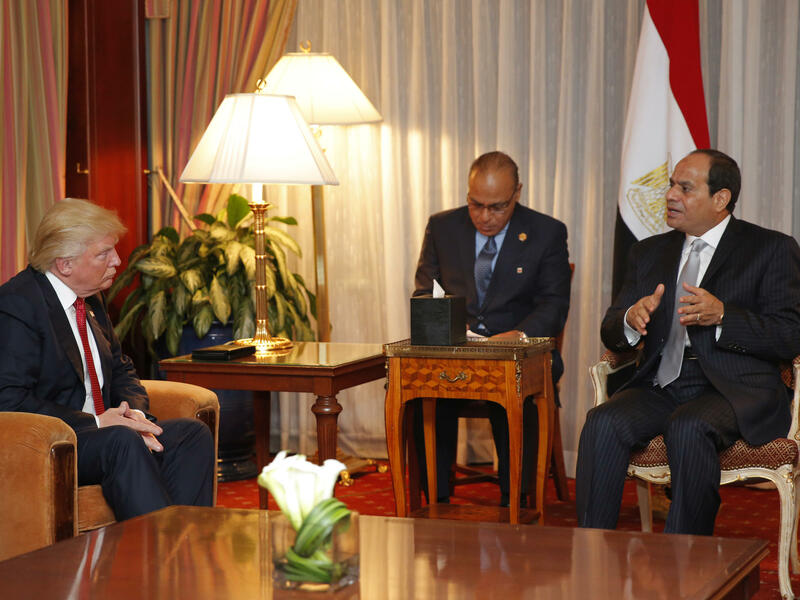 Donald Trump met with Egyptian President Abdel- Fattah el-Sissi in New York in September. Trump and his advisers have suggested that they will strengthen alliances with leaders, including Sissi, who have taken a hard line against Muslim extremism. To Donald Trump, one of President Obama's major failings was his refusal to identify "radical Islam" specifically as America's top adversary. "Anyone who cannot name our enemy is not fit to lead this country," Trump told a crowd in Ohio in August. "Anyone who cannot condemn the hatred, oppression and violence of radical Islam lacks the moral clarity to serve as our president." Obama, with the support of many counterterrorism experts, wanted to avoid any suggestion that the United States was engaged in a religious war with Islam, but Trump and his supporters argued that Obama's reluctance to denounce "radical Islam" by name was tantamount to a refusal to battle Muslim extremism on an ideological as well as a military basis. In his speeches, Trump often cited the Cold War, when the United States and its allies waged a propaganda war against the communist philosophy, using radio broadcasts and other tools. "Just as we won the Cold War by exposing the evils of communism," Trump told the Ohio crowd, "so, too, must we take on the ideology of radical Islam." But making an argument against communism was a less ambitious project than challenging a global religion, even a particular interpretation of it. Trump's intention to fight "radical Islam" could mean a major — and risky — escalation of the counterterrorism policies of his White House predecessors. While he has had little to say in the last month about his exact plans, Trump has sent some signals through his personnel choices. His national security adviser, retired Lt. Gen. Michael Flynn, promoted ideological war on "Islamism" in a book he co-authored this year with Michael Ledeen, a prominent neoconservative writer. "We're in a world war against a messianic mass movement of evil people," Flynn and Ledeen wrote, "most of them inspired by a totalitarian ideology: Radical Islam." Flynn has avoided interviews since Trump chose him as national security adviser, but in an interview with NPR, his co-author elaborated on the notion of going to war against Muslim extremism. As an example of how an ideological struggle could be waged, Ledeen said he had argued that President George W. Bush needed to challenge Islamists who fought in the name of Allah back in 2007, when U.S. and allied forces defeated the Iraqi branch of al-Qaida. "It's important," Ledeen continued, "to put the events on the ground in an ideological context and ask them questions about their religious convictions. We drove the Taliban out of Afghanistan for a while, and they went to Pakistan. We should have stood up and asked them if they felt they had been abandoned by Allah." Whether such an argument would have been effective with devout Muslims, however, is debatable. "If we go in and tell Muslims that they are interpreting their religion in the wrong way, the response is obviously going to be, 'Who the heck are you to tell us that?'" says Shadi Hamid, the author of Islamic Exceptionalism: How the Struggle Over Islam Is Reshaping the World. Writing as a Muslim himself, Hamid acknowledges that Islam is often interpreted in an especially political way, but he questions what can be gained by a Trump administration challenging Islamist ideology. "Trump and the people around him are seen in a lot of the Muslim world as being anti-Muslim," Hamid argues. "So already, people are very suspicious of what a Trump administration has to offer." Another element of the Trump plan for waging war on "radical Islam" would be to require "extreme vetting" of immigrants from Muslim countries, to screen out those with radical views. During his presidential campaign, Trump also said he would "bomb the s*** out of ISIS," referring to the self-declared Islamic State of Iraq and Syria. Here, too, Trump's intentions may be reflected in his presidential team. His choice to lead the CIA, Rep. Mike Pompeo of Kansas, said in a speech last year that he saw a dividing line between those Muslims who accept "modernity" and those who are "barbarians." "We should never be fearful to walk right up to that line," Pompeo argued, "find those on the other side and crush them." Such an exercise, however, assumes such a line can be drawn cleanly and easily. In practice, that distinction is rarely clear, and military operations to "crush" an apparent adversary could backfire. "Until someone commits an act of violence, it is hard to know what they actually believe," says Will McCants, director of the Project on U.S. Relations with the Islamic World at the Brookings Institution. "The U.S. government and the incoming Trump administration will have to decide where they want to draw that line." The United States, McCants points out, already goes after terrorist groups like al-Qaida and ISIS that specifically target the United States. "Are we worried about violent groups that don't target the U.S.?" he wonders. "Are we worried about anyone who advocates for radical social and political change, regardless [of] if they use violence or not? If we draw that circle widely, we risk provoking a number of people to come after us in a way they would not otherwise." Trump and his advisers have suggested that they will strengthen U.S. alliances with leaders in the Middle East who have taken a hard line against Muslim extremism. Chief among them is Egyptian President Abdel-Fattah el-Sissi, who has waged a bloody war on the Muslim Brotherhood, a strident Islamist movement that renounced violence in the 1970s. "Sissi is someone who draws the circle of his enemies very widely," says McCants. "If we partner with him, we also risk making [many] enemies." It is beyond dispute that the United States confronts a tough adversary with Muslim terrorists. Countering them has been a challenge for the Obama administration, and it will be no easy task for a Trump administration, either. Donald Trump has said that the number-one threat facing the United States is the following. DONALD TRUMP: Radical Islamic terrorism. MARTIN: Most experts say counterterrorism policy shouldn't target the religion of Islam itself, but Trump is promising an especially sweeping approach to the terrorist threat. NPR's Tom Gjelten reports. TOM GJELTEN, BYLINE: One of Trump's criticisms of President Obama and of Hillary Clinton was that they seemed reluctant to use the words radical Islam. It was not just semantics. Trump said it's important to name the enemy idea and then attack it. Consider the Cold War. The U.S. and its allies waged a kind of propaganda war against the communist idea using radio broadcasts and other tools. Trump has said he'd do the same against Islamic extremism. TRUMP: Just as we won the Cold War in part by exposing the evils of communism and the virtues of free markets, so, too, must we take on the ideology of radical Islam. GJELTEN: But making the argument against communism is one thing. Taking on a religion - even one interpretation of it - is something else. Trump hasn't had much to say since the election about fighting radical Islam, but his national security adviser, retired Lieutenant General Michael Flynn, promotes ideological war on radical Islam in a new book he wrote with Michael Ledeen. In an interview, Ledeen offered this example - George W. Bush should have mentioned Allah back when the U.S. defeated al-Qaida in Iraq. MICHAEL LEDEEN: I said Bush should stand up and say, OK, you've been saying all these years that your success demonstrates that Allah supports you, and that is what is responsible for your victories. So what happened here, exactly? Did he change sides? Is he now on our side? Because you've lost. GJELTEN: The point, Ledeen says, is to challenge Muslim extremists on their religious convictions. But then what? SHADI HAMID: If we go in and tell Muslims that they are interpreting their religion in the wrong way, the response is obviously going to be, who the heck are you to tell us that? GJELTEN: Shadi Hamid's new book is "Islamic Exceptionalism." As a Muslim, he acknowledges that Islam is interpreted in especially political ways, but he wonders what can be gained by Donald Trump challenging Islamist ideology. HAMID: Trump and the people around him are seen in a lot of the Muslim world now as being anti-Muslim. So already people are very suspicious of what the Trump administration has to offer. GJELTEN: Trump has called for extreme vetting of Muslim immigrants. He'd also use military force in going after terrorists. His choice to lead the CIA, Congressman Mike Pompeo, said last year that the key line is between Muslims who accept modernity and those who are barbarians. We should never be fearful to walk right up to that line, he said, find those on the other side and crush them. But Will McCants of the Brookings Institution says the U.S. government already attacks groups that target the U.S. As the director of a project on relations with the Islamic world, he asks whether it makes sense to draw the line with violent groups that don't target the U.S.
WILL MCCANTS: Even a step further, are we worried about anybody who advocates for radical social and political change, regardless of whether they use violence or not? If we draw the circle that widely, we end up provoking a number of people to come after us in a way that they would not otherwise. GJELTEN: Clearly the United States faces a tough adversary with Muslim terrorists. Countering them has been a challenge to the Obama administration, and so it will surely be for the Trump administration. Tom Gjelten, NPR News, Washington. Transcript provided by NPR, Copyright NPR.